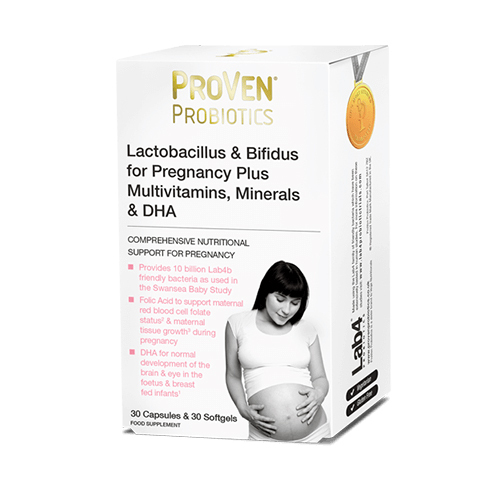 ProVen Lactobacillus &Bifidus - Multivitamins Minerals and DHA provides support during pregnancy. Combining 20 essential vitamins and trace minerals at levels tailored to be most suitable for the pregnancy period. 30 day supply. Hassle free tear off strips containing capsules and softgels. Provides at least 100% RDA of all essential vitamins. It is also now recognised that healthy bacteria are just as important to the new born baby as to adults and that the establishment of a robust population of friendly microflora as soon after birth as possible is critical in driving the development of a healthy immune and intestinal function. However, it is now acknowledged that modern living conditions, particularly for the newborn baby, may inhibit or slow down the natural development of the normal flora, and that this process needs a ‘boost‘ to help intestinal and immune development. Bifidobacterium bifidum (CUL-20), Bifidobacterium animalis subs p. lactis (CUL-34), Lactobacillus salivarius (CUL-61), Lactobacillus paracasei (CUL-08) - Containing 10 billion viable cells. Calcium Carbonate, Ascorbic Acid, Magnesium Oxide, Vegetarian Capsule Shell (Hydroxypropyl Methylcellulose), Microorganisms (Lactobacillus salivarius CUL61, Bifidobacterium animalis subsp. lactis CUL34, Bifidobacterium bifidum CUL20, Lactobacillus paracasei CUL08), Ferrous Fumarate, Nicotimamide, Zinc Citrate, N-Acetyl Cysteine, Manganese Gluconate, Dicalcium Phosphate, Corn Starch, Calcium Pantothenate, Alpha Lipoic Acid, Anti-caking Agents (Silicon Dioxide, Magnesium Stearate), Microcrystalline Cellulose, Corn Maltodextrin, Vitamin B6 (Pyridoxine Hydrochloride), Modified Corn Starch, Thiamine Mononitrate, Riboflavin, Copper Citrate, Acacia Gum, Sunflower Oil, Antioxidants (Sodium Ascorbate, DL-Alpha Tocopherol, Ascorbyl Palmitate), Sucrose, Folic Acid, Chromium Picolinate, Potassium Iodide, Sodium Molybdate, Sodium Selenite, Biotin, Vitamin K1 (Phylloquinone), Vitamin D3 (Cholecalciferol), vitamin B12 (Cyanocobalamin). Tuna Oil (Fish), Softgel Shell (Bovine Gelatin, Glycerol, Colours (Copper Chlorophyll, Titanium Dioxide, Iron Oxide)), vitamin E (D-Alpha Tocopheryl Acetate), Olive Oil, Beta Carotene (Dunaliella salina), Antioxidant (Natural Mixed Tocopherols). Women who are pregnant or planning a pregnancy should consult their doctor before taking supplement. Below are reviews of ProVen Lactobacillus & Bifidus Pregnancy Plus & DHA by bodykind customers. If you have tried this product we'd love to hear what you think so please leave a review. 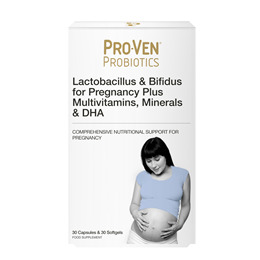 ProVen Lactobacillus & Bifidus - Multivitamins Minerals and DHA provides support during pregnancy. Combining 20 essential vitamins and trace minerals at levels tailored to be most suitable for the pregnancy period. 30 day supply.